Do you ever have the sense that you are being watched? I noticed these two in my peripheral vision. Staring through my study window. Make no mistake ... at about half a metre beak to tail, they are big. And curious. Some people might (understandably) be a little wary of them. I think they are wonderful. They have glossy midnight feathers and jewel-like aquamarine eyes. This year they have a baby. A big, fluffy clown who doesn't know any better. It sits on my front porch and plays with the bobbing red faces of my potted gerbera. Lacking any sense of self-preservation, it runs towards you instead of away. I've grown fond of its shouty, gravelly call. 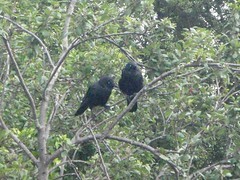 I hope this friendly raven family stay for a while. huh! This is not the only perving I have heard of by ravens going on in Australia right now. Is there something in the water? Lucky you, to have them within convenient watching distance! I've seen ravens in the woods (northeast USA) but never that close to my home. Bears? yes. Ravens? not yet. What a coincidence. When I went to work on Sunday there were ravens everywhere in the shopping centre (I work in an outdoor shopping centre). I have never seen so many of them in one day. Any chance of a piccy of the baby? I love when they're all cute and bucket mouthed and fluffy! I saw some creepy Ravens out on the wire at night! They were just there staring as they do, they gave me the heeby geebies when I noticed them so I scooted back inside! By the way, love your Santa suggestion! I used to work in a great glass-walled building, and you'd glance out the window to find one eyeing you off. MASSIVE, they were. Like they were planning on EATING you. Oh, I love Ravens so much. They are wonderful birds. I have some that live in my street and they make me happy every time I see them. I think they are fortuitous. Day before yesterday a pair was eying my friend and I at a nature reserve..the whole time we were there, they were in one tree or another near us, just WATCHING. Very unsettling. This is pretty interesting site. How lucky u r..I have never saw ravens that much closer. I love Ravens so much. They are wonderful birds. I have some that live in my street and they make me happy every time I see them. I think they are fortuitous.